The River Don Trading Company was formed in 1880, when Mr and Mrs John Henry and two associates took over the sawmill, shipping and trading business commenced by Messrs Cummings and Raymond at the River Don, in 1853. John Henry had been part owner of the business since 1872, first as Cummings, Henry and Co, and then John Henry and Co. The Company was the largest business establishment on the north-west coast, comprising a sawmill, shipping fleet, furniture and upholstery factories, cooperage, butchery, bakery, store and vast acreages of land. After one of the fires which periodically engulfed the premises, this time in 1880, John Henry dropped the less profitable arms and concentrated on his trading stores. 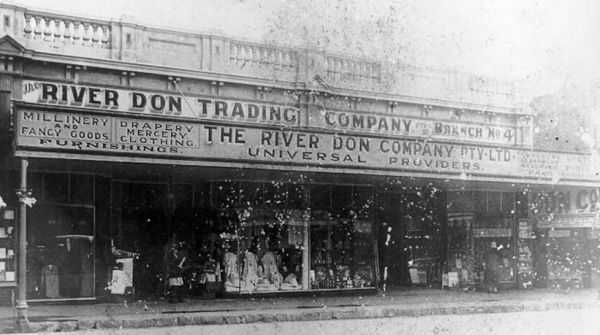 The River Don Company became a household name after Henry moved his headquarters to Devonport in 1887, and established branches at Sheffield, Ulverstone, Burnie, Wynyard and Zeehan. The original store at the River Don was leased to William Wells, who moved to Latrobe in 1893 to established William L Wells and Sons. Succeeding generations of Henrys managed the Company. All branch stores ran their course and eventually closed, leaving behind impressive buildings, and the Devonport premises were sold to Woolworths in 1961. Further reading: F Gardam, Sawdust, sails and sweat, Port Sorell, 1996.